Is a bubble always round? Most bubble wands are circular, so is that why bubbles come out round? What happens if you use a different shaped bubble wand? Can you make a square bubble? Try it! Note: Adding glycerin to the bubble mixture makes the bubbles stronger and last longer. Ask student to create a testable question. 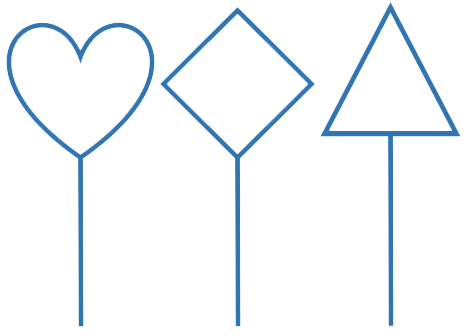 Example: Will a triangle bubble wand make a triangle-shaped bubble? Using the pipe cleaners or bendable wire, create bubble wands of different shapes and sizes. Dip your custom-shaped bubble wands into the bubble mixture and blow bubbles. What do you observe? Construct a cube using pipe cleaners (or wire or straws and clay). Dip the cube in the bubble mixture and pull it out slowly. 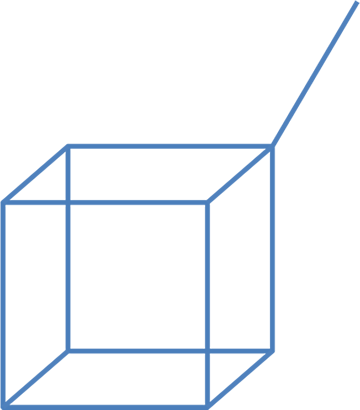 If a square bubble does not instantly appear in the center of the frame, dip the end of your straw in the solution, insert into the center of the cube and gently blow a bubble within the cube. What do you observe? What if you construct a 3-dimensional triangle, does it make a triangle-shaped bubble? Does the shape of the bubble wand determine the shape of the bubble? Why or why not? No. Blowing bubbles using a wand with a two-dimensional shape at the end the bubbles will always be round. How do the sides of the cube-shaped frame help make a square bubble? The cube-shaped frame helps create many bubbles that share space. The bubble in the center of the frame is squished by the other bubbles pressing in on it. This pressure causes it to form a cube-like shape. What happens when you try to release your cube bubble into the air? Without the constraints of other bubbles around it, the bubble will turn into a sphere! Why did we need to create a cube shape for the wand and not just a 2D square? A 2D square wand would just create one bubble. Any frame that creates a solitary bubble will produce spherical bubbles! What other types of bubble shapes do you think you can make? A free flying bubble, made with a flat two-dimensional (2D) wand shape will always be round. This is because when you blow a bubble, the soap solution stretches as the air flows into it, and the air pushes equally on all sides of the bubble causing the water molecules to stick together in the tightest possible groupings which makes a sphere. Thank you, surface tension. Hydrogen atoms in one water molecule are attracted to oxygen atoms in another water molecule. They like each other and cling together. Soap molecules help them become “stretchy” or “flexible” by butting in and decreasing the force of the attraction. Soap (and the glycerin) also reduces evaporation of water molecules so individual bubbles can last longer. Bubbles use surface tension to enclose the volume of air trapped inside and this creates a perfectly spherical bubble with equal pressure on all sides. When you dip the three-dimensional (3D) cube frame into the bubble liquid, you create many bubbles that surround one center bubble. Even though the center bubble naturally wants to become a sphere, the pressure from the other bubbles pushing against it causes it to form a cube shape! The molecular attraction that holds the surfaces of two dissimilar substances together. The force exerted by air, whether compressed or unconfined, on any surface in contact with it. A physical property of a substance, caused by the intermolecular attraction between like-molecules within a body or substance that acts to unite them. A force present within the surface layer of a liquid that causes the layer to behave as an elastic sheet. Surface tension is caused by the attraction between the molecules of the liquid. The smallest unit of the substance of water that contains all properties of water. A water molecule can be divided into tiny parts called atoms. This produces two hydrogen atoms and one oxygen atom.